queen buff-tailed bumblebee - perhaps? Observation - queen buff-tailed bumblebee - perhaps? - UK and Ireland. 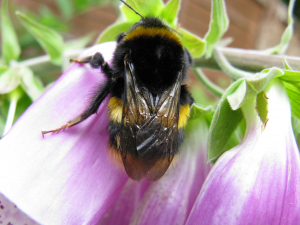 Description: Very large bumblebee, with two yellow bands, feeding on foxglove flowers. I am not certain about this ID - I would be grateful for feedback as to what ID features to look out for. Very large bumblebee, with two yellow bands, feeding on foxglove flowers. I am not certain about this ID - I would be grateful for feedback as to what ID features to look out for.